The soft-sounding term 'launch pad' belied the true nature of Pads A and B at Launch Complex 39. Each of these two massive, hard, angular concrete structures consisted of a low concrete hill split in two by a trench whose base was level with the surrounding land. This was to allow a large wedge-shaped flame deflector of appropriately large dimensions to be wheeled beneath the rocket without descending below the local water table. The alignment of the trench ran along a line towards true north. This was engineering audacity on an immense scale. The entire space vehicle with its launcher and transporter was substantially heavier than the Eiffel Tower. Yet all of its 8,400 tonnes were driven up a 5-per cent incline to the top of the 12-metre hill. As it climbed, the launcher was kept level by the crawler's jacking system, and then gently set down upon six piers to sit astride the trench. 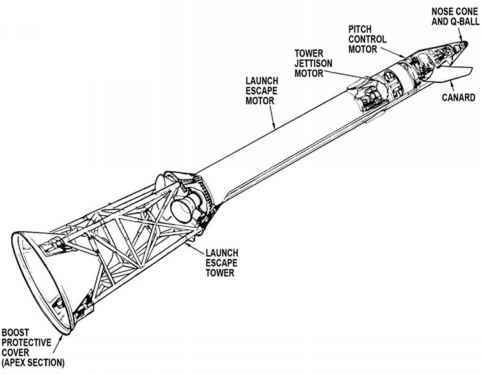 The crawler then withdrew and the flame deflector rolled beneath the cavity in the launch platform to force the flames from the Saturn's first-stage engines sideways along the trench in order to protect the vehicle from damage from reflected acoustic energy. All the surfaces directly facing the Saturn's 1,500°C exhaust had to be lined with a suitable refractory material. Arranged around the pad's central hill were ancillary buildings and equipment for storing and feeding propellants, gases, water and power to the vehicle, ponds for fuel spills, a hydrogen-burning pond and a network of roads. The designers of the Apollo/ Saturn launch facilities had been swept up in the optimism of the programme's early days, when the Earth-orbit rendezvous method of getting to the Moon implied a much higher launch rate than was ever realised when the complex saw use. Thus two pads were built with planning for a third having left a tell-tale kink in the crawlerway leading to Pad B. The complex had been designed to process as many as three stacks simultaneously. In reality, Pad B was only ever used once during the Apollo programme, for Apollo 10. The Apollo 10 space vehicle stands on Pad 39B. This was during the very peak of the programme as the final push was being made for the Moon in 1969 and launches were occurring at bimonthly intervals. Having delivered the space vehicle to the pad, the crawler's next task was to retrieve another huge tower from its parking site just off the crawlerway and bring it to the rocket. This mobile service structure (MSS) shielded the spacecraft from the weather and provided access all around it for final preparation. This was yet another mobile engineering marvel among marvels, itself weighing over 4,700 tonnes.